Chart No. 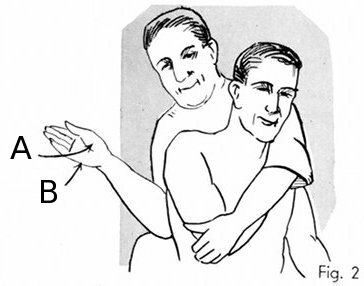 45 - A Specific Contact in the Sitting Position for Adjusting Fixations of Dorsal [Thoracic] Vertebrae and Anterior Dorsals [Thoracics] - a Stretch of the Spine for the Release of Gases. Figs. 1-2 show the preparation for the lift and the contact points on the hand over the spine. This can be done on either side. The contact for any anteriority is on the vertebrae below it so the fulcrum is on the anteriority of the joint by the support immediately below it. This contact can also be used on the transverse process for rotation or fixation of spinal articulations. Fig. 3 shows the application with the elbow supported on the knee of the operator as a fulcrum. 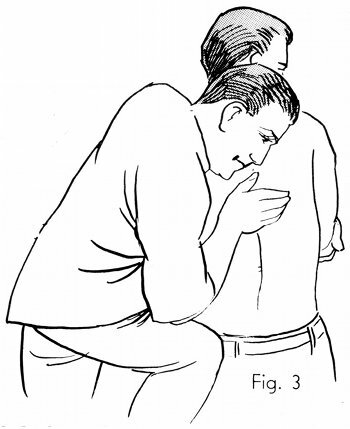 The operator's other arm is in front of the shoulder with a hold on the patient's elbow for the lift. 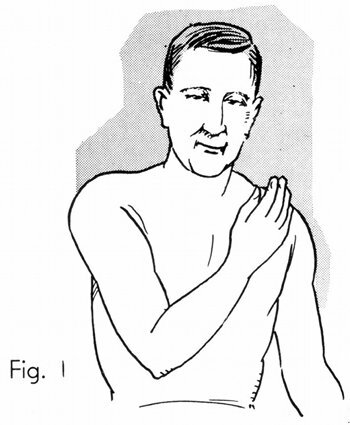 This can be a gentle rocking motion and stretch of any articulation in the spine to separate them and hold them for a moment for the reflex release of gas in the bowels and tissues. The adjustment is merely an increase in the lift and the fulcrum, raised by the supporting knee. It is easier than it looks and needs but little force. Fig. 4 shows the application in the upper dorsals [thoracics] with the head bent further forward for the correction of the anteriority of any vertebrae selected. 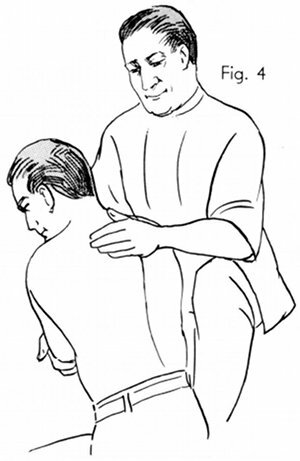 Extreme tenderness on the spinous process is usually a definite indication of it. However, any fixation may act like an anteriority and should be treated as such.